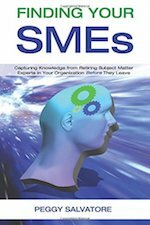 Finding Your SMEs: Capturing corporate knowledge working with your subject matter experts – A 2 1/2-hour workshop to help you find and capture internal knowledge from your retiring experts today. Also available as a DIY training kit for your organization. Contact us for pricing and options. When Your SME Goes Live – A train-the-trainer workshop. Available as a training template including powerpoint slides and a facilitator’s guide to incorporate into your existing training program. May be customized and presented as a workshop for your team. Getting The Best From Your Best: How to Work With Your Subject Matter Experts – A 2-hour workshop with practical tips, tools and checklists for capturing knowledge from your critical employees. 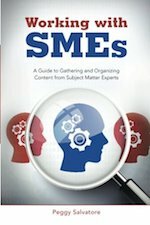 Based on the book Working With SMEs.